Creamy, chocolate pot de creme topped with toasted marshmallows and graham cracker crumbs with a chocolate drizzle. The perfect, easy dessert for two! I had heard a lot of great things about Cincinnati, so my husband and I made a quick stop on our way back to Nashville after visiting family for Thanksgiving. 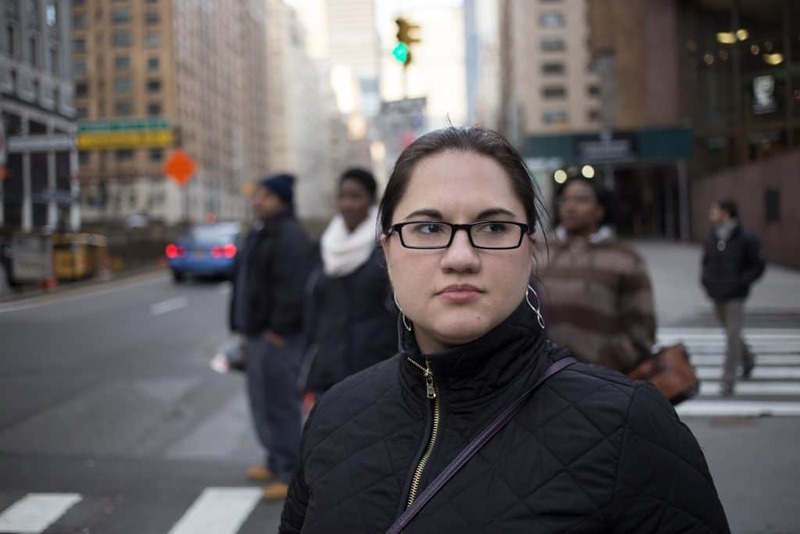 The whole city was out enjoying the mild weather of late November. Our hotel overlooked the Christmas tree and ice skating rink set up for the holidays. In the evening we walked to the trendy Over-the-Rhine neighborhood. After a beer and a game of Battleship at Rhinegeist Brewery, we stopped next door at Sartre for dinner. The whole meal was delicious, but my most memorable dish was the Chocolate Pot de Creme for dessert. This was the tastiest pot de creme I’ve ever eaten, with just the right balance of rich chocolate flavor and a creamy mild sweetness. So what is pot de creme? Well, pot de creme (pronounced Poe deh krem) literally translates as “pot of custard” or “pot of cream.” Most versions I’ve had incorporate chocolate in some way, so it’s basically like a baked, creamy chocolate custard. 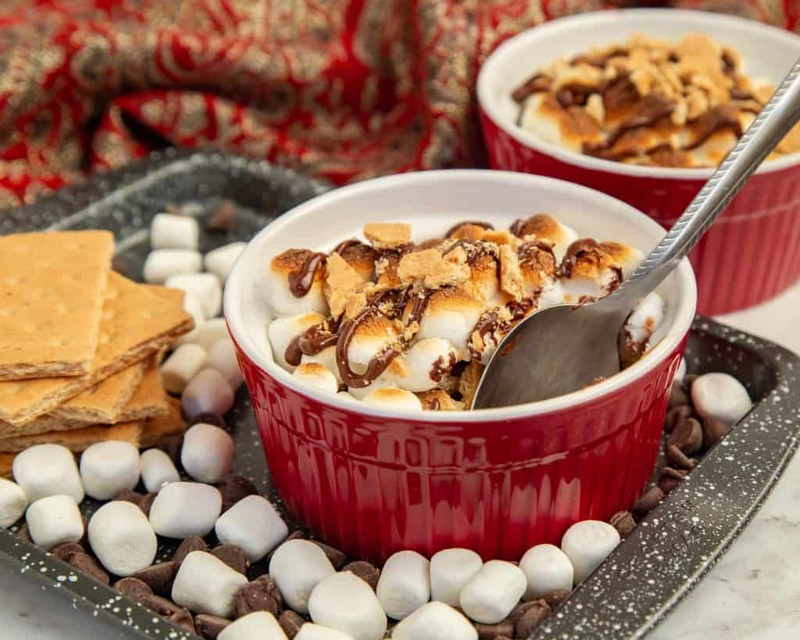 When recreating this dish at home I wanted to make it a bit special, so I added some marshmallows and graham crackers on top. The crunch of the graham crackers and sweetness of the toasted marshmallows perfectly complements the richness of the chocolate custard. The best thing about this dessert (outside of actually eating it) is that you can make it ahead of time and just broil for a few minutes right at the end. It looks like there are a lot of steps to make pot de creme, but they’re all very simple and the end result is delicious and impressive, so bear with me. Start by preheating your oven and prepping your ramekins or custard cups. I used two large 8 oz ramekins. If you plan to use smaller 4 oz ramekins, you’ll need 4 of them. Place the ramekins in a baking dish large enough to comfortably hold them. I used a 9-inch x 9-inch pan. Then pour water in the pan until it’s about halfway up the sides of the ramekins. Using a water bath like this helps the custard cook gently and evenly. Then grab two medium to large mixing bowls. At least one of these needs to be a microwave-safe bowl. Add the milk and cream to the microwave-safe bowl and heat in the microwave for 30 seconds at a time. You want the mixture to be very hot but not boiling. This should take about 2 to 3 minutes. Then break the chocolate into small pieces (or just use chocolate chips) and add to the cream and milk mixture. Whisk the chocolate, cream, and milk together until the mixture is smooth. It should look like hot chocolate. Set the bowl aside. In your other bowl, add the egg yolks and sugar. Whisk them together until they’re well combined. You can use the same whisk from the previous step, no need to wash it first. Then you’ll add your hot chocolate mixture to the egg yolks gradually, whisking well. Pour the mixture into your prepared ramekins and bake for 35 to 45 minutes (closer to 30 minutes if using smaller 4 oz ramekins). The pot de creme should no longer be liquidy and will be slightly jiggly. Remove from the oven and allow to cool for an hour. If you’re going to serve these pot de creme later, then cover with plastic wrap and refrigerate. When you’re ready to serve, heat some more chocolate in a small microwave-safe bowl. You’ll use this as a chocolate drizzle. Turn the oven broiler on “High.” Crumble up two of the graham cracker squares and sprinkle over the pot de creme in the ramekins. Add a handful of mini marshmallows to each. Broil for 60 to 120 seconds until the marshmallows have puffed up and are browned to your liking. Pour the melted chocolate over the marshmallows. You can either spoon the chocolate on top, or put the melted chocolate in a plastic bag, snip off the corner, and drizzle the chocolate on top of the marshmallows. Crumble up the two remaining graham cracker squares and sprinkle on top. Serve warm. Looking for some more chocolatey desserts? Check out these easy Cookie Dough Balls or this Double Chocolate No-Churn Ice Cream. 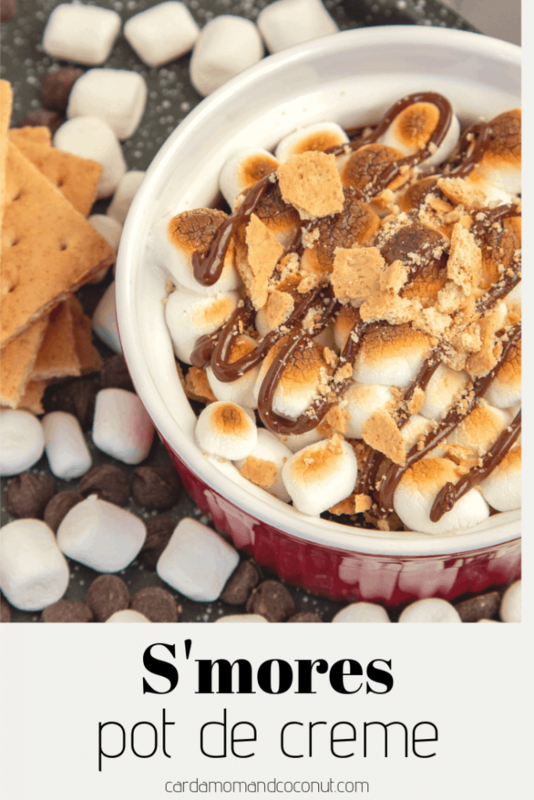 If you try this recipe for S’mores Pot de Creme please leave a comment and a review below to let me know how you liked it! Place two 8 oz (1 cup) ramekins in a baking dish, like a 9-inch x 9-inch square pan or any baking dish large enough to fit both (see note if using smaller ramekins). Pour water in the baking dish until the water comes about halfway up the sides of the ramekins. Take out two medium to large mixing bowls – one needs to be microwave safe. Add the cream and milk to the microwave-safe bowl. Heat in the microwave in 30-second increments until the milk and cream mixture is very hot, but not yet boiling. This takes about 2 to 3 minutes. Break up the chocolate into small pieces and add to the hot cream and milk mixture. Mix together with a whisk until the chocolate and the cream milk mixture are combined. It should look like hot chocolate. Set aside. In the other bowl, add the egg yolks and sugar. Whisk them together until well combined (you can use the same whisk you used in the previous step, no need to wash it first). Gradually add the hot chocolate and cream mixture to the egg yolks, whisking well. Then pour the chocolate mixture into the prepared ramekins. Bake for 35 to 45 minutes until they’re slightly jiggly and no longer liquidy. Remove from the oven and allow to cool for about an hour. If serving later, then cover the ramekins with plastic wrap and refrigerate. When ready to serve, add the chocolate to a small microwave-safe bowl and microwave in 15-second increments, stirring after each one, until melted. Set aside. Turn the oven broiler on “High.” Crumble up two graham cracker squares and sprinkle over the top of the chocolate mixture in the ramekins. Add a handful of mini marshmallows on top of the graham crackers. Place in the oven for 60 to 120 seconds, checking frequently, until the marshmallows are toasted to your liking. 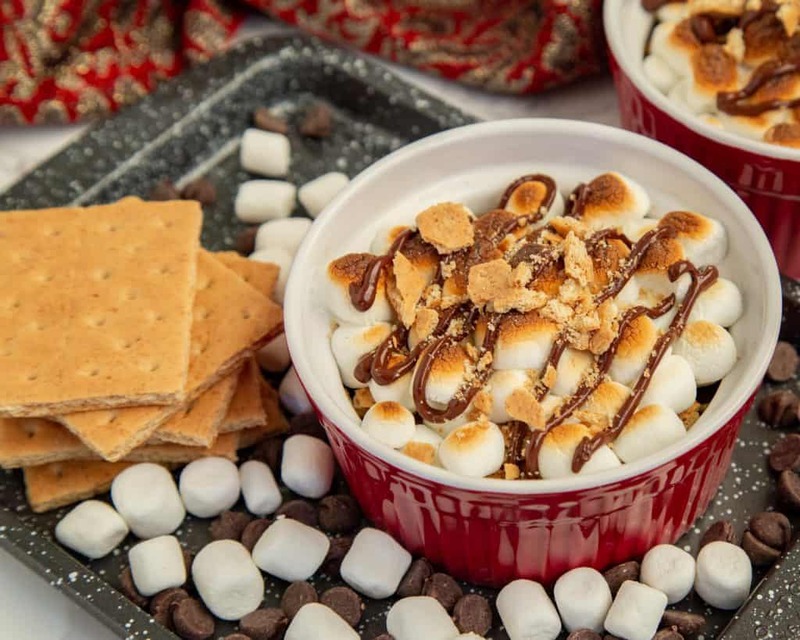 Spoon the melted chocolate on top of the marshmallows and sprinkle with the remaining graham crackers. Serve warm. An 8 oz ramekin holds about 1 cup of liquid comfortably. If you have smaller ramekins or custard cups, then just increase the servings – for 4 oz ramekins you’ll want to use 4 of them. If using 4 oz ramekins, then place them in a larger baking dish like a 9 inch x 13 inch pan. OMG this looks so good. I love S’mores so I will have to make this soon. 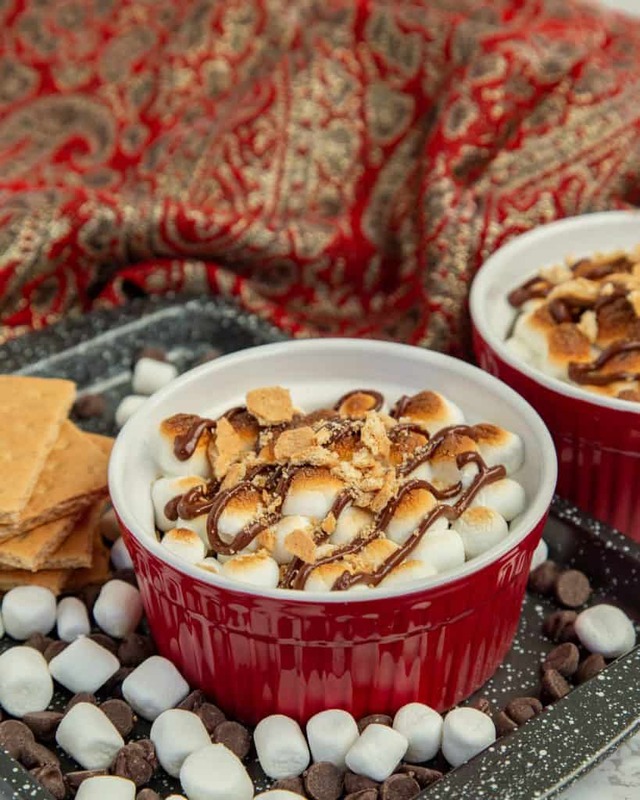 I love S’mores and these look so fancy done up this way! My only trip to the Cincinnati area was being stuck at the airport overnight, but I’d love to go back on an actual planned stop there 🙂 You had me at s’mores with this dessert and I love that it’s for two. Wowza! What an over-the-top delicious dessert! 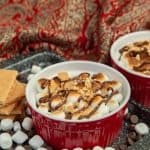 I love Pot de Creme and add the s’mores situation and, oh my! Cincinnati sounds like a fun place to be during the holidays. Looks so delicious and perfect for Valentine’s day!